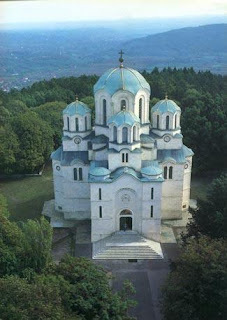 Oplenac (Serbian Cyrillic: Опленац) is the historic place of the mausoleum of the Serbian Karađorđević Royal Family located in central Serbia near the town of Topola. It is known for the St. George Church. In the 19th century this area was covered in woods. 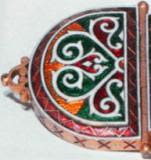 The term Oplenac most probably derives from "oplen", meaning wooden parts on ox cars. Karađorđe had settled here, built vineyards and orchards, and established the defence of the nearby Topola town. His son Alexander built new buildings and renewed his father’s vineyards and orchards. It was not until the arrival of King Peter I of Serbia that this place got its true importance. Besides the Mausoleum (St. George church), there are other objects that encompass the Foundation of King Peter I – King Peter's House, King’s villa, Queen’s villa, Vineyards, Vineyard Keeper’s House, etc. Visitors can also visit the historic town of Topola located nearby, a traditional stronghold of the Karađorđević family, ever since the time of Karađorđe, Leader of the First Serbian Uprising of 1804. There they can see what remains of the old Topola town, Karađorđe’s church and Karađorđe’s monument. 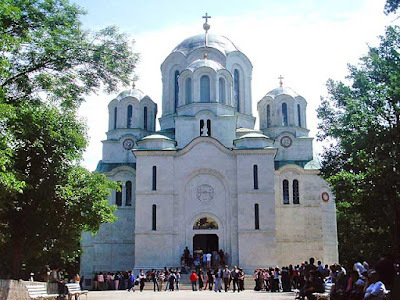 Peter I, upon assuming Royal Duties in 1903, chose a spot 337 metres (1106 ft) on the top of Mali Oplenac for the location of his St. George Church. In 1904 the cornerstone was laid, and the Charter dedicated to St. George was placed in the foundation. On May 1, 1910 construction started following the Kosta J. Jovanović’s plan, and on September 1, 1910, the foundation was mostly completed. In 1911 the building process continued at a fast rate, and the church was already under the dome. In the autumn of 1912 the church was generally complete and ready for consecration. 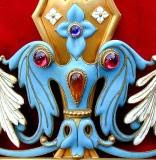 The Serbian Archbishop Dimitrije consecrated the church on September 23, 1912. During pauses of the 1912-1913 Balkan Wars and the First World War, there was also a pause in the construction of the church. When Austria-Hungary occupied Serbia in the winter of 1915, the church was looted, and using the excuse that important records might be hidden the occupiers desecrated the graves in the crypt. Returning to the liberated homeland and to the historical creation of the Kingdom of Serbs, Croats and Slovenes, Peter I was not able to see completion of his foundation. The king died on August 16, 1921, and his successor Aleksandar I took over its completion. He modified the original plan.The church was once again consecrated in September 1930. Church services were held until 1947. After that it was declared an exceptional cultural monument and open to visitors. The church is a five-domed structure. The interior length of the temple is 30 metres (98 ft), and the height of the arch is 27 metres (89 ft). The width of each narthex is 9 metres (29 ft), and so is the span of the central dome. All four façades were made from white marble, which comes from the Venčac Mountain. Copies from 60 Serbian medieval churches and monasteries had been brought to the St. George church at Oplenac. 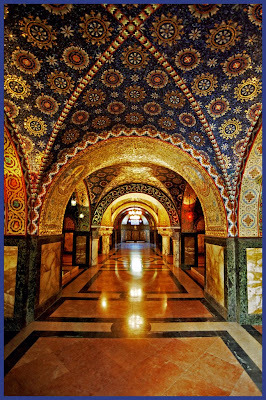 The entire mosaic has 725 painted compositions (513 in the temple and 212 in the crypt), on which there are 1500 figures. The entire area of the mosaic is 3,500 square metres (38,000 sq ft); with 40 million various coloured pieces of glass which have 15 thousand different varieties of colour, making the most vivid artistic impression. The fourth generation – the nine children of Prince Alexander and Princess Persida, as follows: Kleopatra (1835-1855), Aleksije (1836-1840), Svetozar (1841-1847), King Peter I (in the tomb in the church), whose wife Princess Ljubica also known as Zorka (1864–1890), former Princess of Montenegro, is buried here in the crypt; moving on with Prince Alexander’s children: Jelena (1846–1867), Andreja (1848–1864), Jelisaveta (1851–1852), Đorđe (1856–1888), and Arsenije (1859–1938). The fifth generation, the children of King Peter I and Princess Zorka : Milena (1886–1887), Đorđe (1887–1972), his wife Radmila (born Radović, 1907-1993); King Alexander I of Yugoslavia (1888–1934), Andrija (1890–1890 – lived only for 23 days). The sixth generation: son of King Alexander I of Yugoslavia – Prince Tomislav (1928–2000). Out of the ten children of Prince Alexander and Princess Persida, only their oldest daughter, Poleksija (1833–1914), was not buried here. Out of the 22 tombs of the Karađorđević Dynasty, four of them belong to rulers: Supreme Leader Karađorđe, Prince Alexander, King Peter I, and King Aleksandar I. It is an important place of Serbian history. Congratulations for a beautiful and informative Monarchist Site. And all the Links that I see! Congratulations THE MONARCHIST INITIATIVE for a great and informative Monarchist Website.It looks very beautiful! I love all the photos and all the History that I read.And all the Links! Hvala! Thanks! Thank you very much, Mr.Krissilas! Become a Monarchist Initiative blogger! Write your very own personal reasons why you are a monarchist, and I'll be more than happy to publish them!